﻿ . :: VIRDI Brasil ::. VIRDI highlighted in Digital Security magazine. What are the ACURA Global’s operation areas in the electronic security market? ACURA acts as manufacturer and distributor of equipments of high aggregated value, software, people’s and vehicles‘s accessories for access control and timeclocks, notedly RFID’s readers, antennas and tags, plus terminals and biometric modules. We always serve the channel, with more than 600 resellers across the country, beyond major manufacturers of security system. What are the company’s business models for the segment of Biometrics and RFID? We look forward to maximize the biometric’s and the RFID’s potential use taking advantage of the synergy between those two to be used at the access control industry. We always focus our business in the channels, and it makes perfect sense in a country of continental dimensions like ours. The spread of our RFID’s and Biometric’s products and solutions depends crucially on continuous training of ours system integrators and resellers. What are the benefits of RFID for electronic security? We can summarize into two major advantages: the first is a huge advantage in terms of intrinsic safety, in the use of RFID chips (radio frequency identification) on systems based on legacy technologies, such as bar code and magnetic stripe. Although not impossible, the counterfeit of the RFID cards that are used in access control systems is unlikely. The use of RFID in the vehicle identification, that has been spread with great speed in the large country urban centers also greatly improved the security in access to residential and commercial condominiums, schools, airports, etc. The second advantage to be highlighted is the comfort provided by RFID. In case of th badges in access control systems, this technology allows identification without physical contact, via radio frequency waves, translating into great satisfaction by the users. The use in vehicles have the comfort in that the car can still be identified in motion and automatically, with RFID tags typically installed internally on the windshields, very similar to the systems used in electronic tolls. 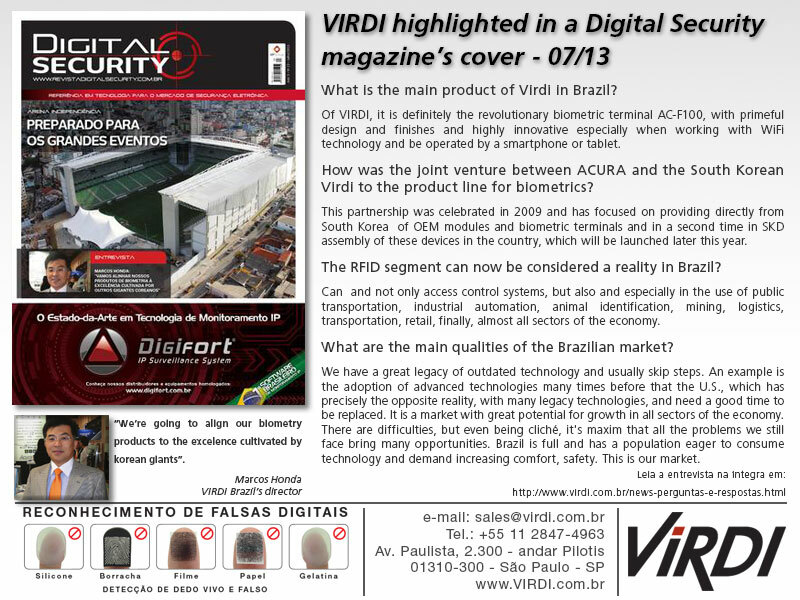 VIRDI of Brazil is a Joint Venture of ACURA Global and VIRDI, largest Biometrics South Korea company and one of the world's largest. 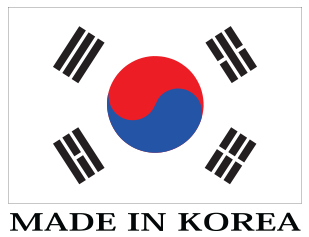 Korea is now recognized for excellence in education and innovation, in addition to quality, design and performance. Companies like Samsung, LG, Hyundai, Kia, to name the most renowned, has dominated the world stage in their segments. Likewise, Virdi is noted by all those features associated with the South Korea. The concept Made in Korea, goes along to our marketing strategy to bind our Biometrics products for excellence cultured by Koreans peers. What is the main product of Virdi / ACURA Global in Brazil? Of VIRDI, it is definitely the revolutionary biometric terminal AC-F100, with primeful design and finishes and highly innovative especially when working with WiFi technology and be operated by a smartphone or tablet. From ACURA Global, the Encrypted AUTOID system, which adds additional security in automatic vehicle identification. How was the joint venture between ACURA and the South Korean Virdi to the product line for biometrics? This partnership was celebrated in 2009 and has focused on providing directly from South Korea of OEM modules and biometric terminals and in a second time in SKD assembly of these devices in the country, which will be launched later this year. How does the ACURA Global’s policy channels work? Very simple. We do not serve the end users. We provide Biometrics and RFID products for major manufacturers and distributors of systems and access control point, as well as systems integrators, scattered throughout the country. I attribute our ability to logistics and technical support, market benchmarks, as largely responsible for our leadership in the segment. What are the main distributors of ACURA Global? Dimep, Telemática, Trix, IDDATA, RW, Trielo, Digicon, Vault, Maxtel, ASP, Task, Sigis, Nepos, WPS, among many others, to whom we owe much of our success and recognition. How do distributors work the brand? Differently, since the major manufacturers of equipment and access control point, prefer to use their own brands, which makes sense, given the notorious recognition, using our products under OEM. Others adopt our various brands as a way to consolidate their solutions and access control point. Disclosure is now more concentrated in web sites, as well as social media and trade shows, and today, on a smaller scale in print. The lack of skilled labor in security is a reality. In RFID this shortage also exists? How does the company work in order to keep integrators updated about the system? Obviously we are not immune to the shortage of skilled labor. We provide regular training in company and our audience, but we also used with great success webinars, distance training using web conferencing tools. How do you assess the participation of ACURA Global in electronic security events? Remains very important and we have participated each year of the main events of the country's security. Our main goal in our holdings,is to honor our business partners, taking advantage of these events to strengthen our relationships and often, just relax, not forgetting however the firsthand dissemination of new releases, always featured at fairs segment. The medical segment seems to be one of the major markets for RFID. In your opinion, how is this sector is being worked on in Brazil? With growing attention in recent years. The use of RFID in the healthcare industry has wide application. Among the main, we can highlight the control to ensure the presence of doctors and health workers in public hospitals, deterring fraud, asset tracking hospital, usually high-value equipment, control babies in hospitals, medication management in public and private and authentication of original drugs, with the use of RFID tags, attesting to their legal origin. What are the main achievements of the ACURA Global? The ACURA has based its operations on constant innovation and pioneering. We introduce the concept of Smart Label, system access control automatic vehicles with RFID Mifare technology, known as a means of electronic payment systems in use in access control, dual technology, which incorporates dual technology in the same card badge, among several others. In terms of development and application of RFID, how is Brazil positioned in relation to the other countries? Brazil is very well in the RFID segment, although its adoption is uneven in different regions of the country. The use of RFID in access control systems is widely disseminated in major cities, as can be observed when visiting any commercial building, universities, etc.. Likewise, the use to control vehicular access and even for anti theft systems are already common place. We have in the country is also a semiconductor factory, already producing RFID chips and develop its own pattern for the toll system and national control of vehicles, Siniav. With regard to security, Brazil is far ahead of its peers in Latin America and very close to the U.S. in some industries. The RFID segment can now be considered a reality in Brazil? Can and not only access control systems, but also and especially in the use of public transportation, industrial automation, animal identification, mining, logistics, transportation, retail, finally, almost all sectors of the economy. How does work the legislation for this sector? Brazilian institutions are prepared for it? We adopt world standards. Under the rules of broadcasting, Anatel for example, has already dedicated chapters certification of RFID equipment. Our laboratories and certification are properly equipped and assets to the challenge of massification of RFID in the country. How is the performance of ACURA Global in foreign markets, especially in Latin America? We have subsidiaries in the USA and Chile and a joint venture in Argentina. We look fondly the best performing countries in our region, such as Chile, Colombia, Peru and Mexico, which has the potential for large-scale adoption of our products and solutions. What is the next technological application of RFID in the ACURA working? We have improved a lot in the safety of our products, with the adoption of encryption on multiple levels. However, the highlight is in Brazil ID system to be adopted nationally by all spheres of government and private participation for drastic reduction of tax evasion, through control by chip, of the cargo moved across the country. Within the government sector, how is the use of RFID technology? Very high, with the system Artesp in SP and Siniav across the country for use in vehicles, and the fact of the various government offices, using RFID already for many years, systems access control. State as the Post Office, Petrobras, Metro SP are just obvious examples that give an idea of how widespread this technology in the country. In terms of electronic security sectors in which Brazil still needs to evolve? Certainly the adoption of RFID in electronic surveillance systems anti theft, called EAS. Also in the dissemination of technology in smaller urban centers and corners of the country, a phenomenon that should be emphasized to the extent that the country grows above average off-axis Rio-São Paulo. How are you planning ACURA Global for the remainder of the year 2013? We are very optimistic for the second half, which actually already started strong in terms of revenues and new opportunities. We are consolidating the development of new products and seeking to expand our workforce not to waste business opportunities. What are the main qualities of the Brazilian market? We have a great legacy of outdated technology and usually skip steps. An example is the adoption of advanced technologies many times before that the U.S., which has precisely the opposite reality, with many legacy technologies, and need a good time to be replaced. It is a market with great potential for growth in all sectors of the economy. There are difficulties, but even being cliché, it's maxim that all the problems we still face bring many opportunities. Brazil is full and has a population eager to consume technology and demand increasing comfort, safety. This is our market.